We are delighted to return to Gauteng for KAMERS 2014 Easter in Johannesburg, 18-21 April at The Forum Campus. The KAMERS team is well known for their innovative sourcing of creative talent and fresh, new product ideas. It is a platform for creative, innovative and upcoming entrepreneurs to showcase unique products that are not easily available in the marketplace. KAMERS is not into the perfectly made or the mass produced, it is about high end true craft, slightly imperfect, timeless and originally designed… that special something that is only found at the shows. 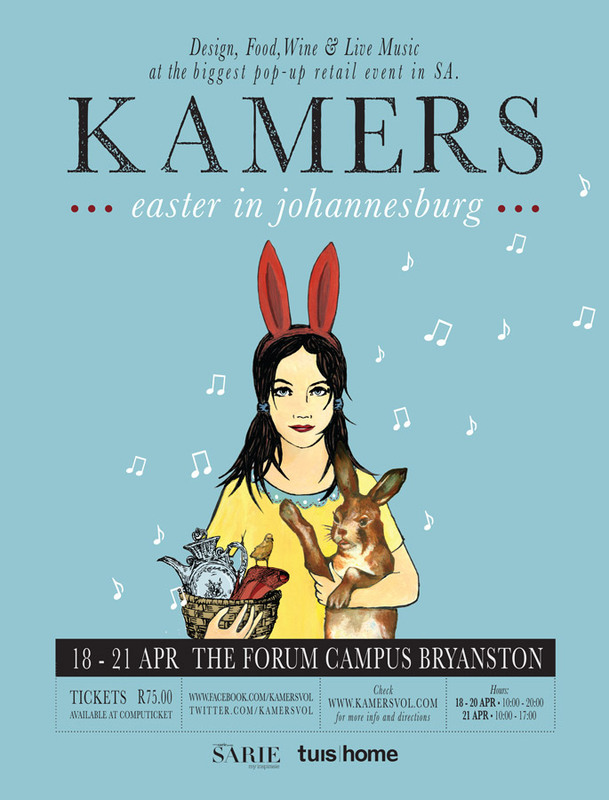 During KAMERS 2014 Easter in Johannesburg there will be a strong focus on food, wine, coffee and music, as it is a long weekend and families are welcome to come along for the outing. It is our first show in Johannesburg and it will be awesome! Expect top quality products and exhibitors. Keep an eye on kamersvol.com and Facebook for more info. Children under 18 enter free. Tags: Bryanston, design, Easter, Food, Johannesburg, KAMERS 2014, live music, The Campus, The Forum, wine. Bookmark the permalink.